A GREEN energy expert, who helped shape UK renewable power policies, says he is convinced aliens have been secretly implanting extra terrestrial DNA into pregnant humans. Author Miguel Mendonça, 42, now claims the so-called alien-hybrid community is expanding on Earth and vital to the future of the human race because of how they are helping us “evolve into higher beings”. Mr Mendonça, from Bristol, was formerly research manager for the World Future Council, which promotes best policy renewable power sources, and has written extensively on green energy policy. However, for his latest publication, Meet The Hybrids: The Lives And Missions of ET Ambassadors On Earth published by Amazon and co-authored with Barbara Lamb, he spent time interviewing eight people who claim they have grown up with implanted alien DNA in their bodies and are part of a mission to improve mankind. Ms Lamb has held great interest in the claims since she first heard them and has been an alien abduction researcher since the 1980s. Mr Mendonça said he began the project with an open mind, but after finishing the research was convinced they were telling the truth and thinks he has now solved the mystery of why UFOs allegedly visit the Earth. Green guru turned alien believer Miguel Mendonça. He said: “I try to keep my feet on the ground as much as possible. “My background is in renewable energy policy gained as an academic, so I have to be sure of my facts. “These hybrids are raising the vibration and awakening people. I have begun to go through this process and to me it is undeniable. “Whenever someone with a strong ET aspect talks to me I feel my energy shift – it just goes through the roof. “I find myself seeing energy with my third eye. “I am a writer, and just wanted to share their stories, and had no clue I would be affected, it’s changed my life. “I will try to use what has been revealed. For one thing, it has solved some of the mystery of the UFO subject. In researching the book, each ‘hybrid’ was given the same set of questions to answer, including how they discovered they were a hybrid, what their genetic make-up was, and why they were here on Earth. Among the interviewees was Robert Frost-Fullington, 36, from California, in the US. He claimed to have DNA from four alien species known as reptilians, Sirians, Tall Whites and those which appear like a praying mantis. He claimed in the book to have had implants inserted under his tongue at the age of five, before experiencing several encounters with aliens. After periods of “conscious recall”, in 2011, he said he realised he was a hybrid. But far from seeing this non-consensual kidnap and interference as sinister, Mr Frost-Fullington and other hydbrids, including women, claim it is being done in the interest of humanity. They all suggested this was triggering an ascension to take place, whereby humans will evolve from the third to an alleged fifth dimension, and lead more spiritual rather than physical lives. Things such as war and violence are likely to end, it is claimed. 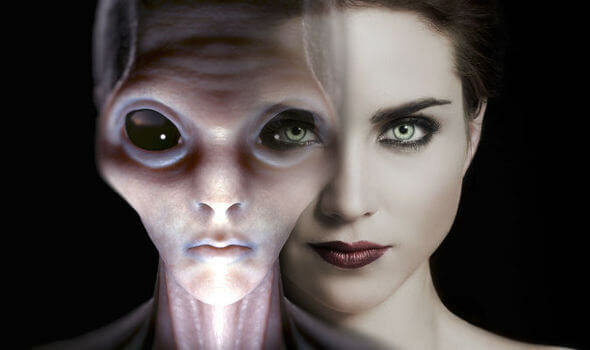 Tatiana Amore, 34, from southern England, was also interviewed, and said she was predominately of the “Pleiadian” race. However, although the hybrid were described as independent, one of them was Cynthia Crawford, 67, from Arizona. It became clear in the book she had counselled and met several of the other interviewees before the research began. Mrs Crawford and Mrs Lamb also both spoke at the 2011 Mutual UFO Network (MUFON) annual convention at the Hyatt Regency Hotel in Irvine, California, according to skepticblog.com. Express.co.uk asked Mr Mendonça why he had not extended the research to interviewing the alleged hybrid’s parents, or more scientific tests, such as putting the subjects through DNA and lie detector testing, and locating their alleged implants for further examination. He added he had not considered the use of lie detectors or scans for implants, but that there had been an “independent verification” of interviewee Charmaine D’Rozario-Saytch, a 28-year-old woman from southern England, having a “possible implant”.